September 14, 2011. Bernard Frost was driving to the Post Office that was several miles away. As he was driving, an ETK K as tailgating him for about a mile. As he was turning, the K swerved around him and the driver had the great idea to breakcheck Bernard on a decline. Bernard smashed into the K. The K driver got out and started trying to fight Bernard, but when that didn't work, the driver got into his car and drove away. Injuries: Bernard had some minor bruising on his wrist and leg. 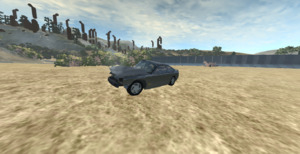 Cars used: ETK K and a Gavril Roamer. Aftermath: Bernard told the police about the incident and went to look for it. They couldn't find anywhere, at least until 6:35... Before K drove away, Bernard managed to snap a picture. Crash Description: September 24, 2018, Firwood, Maine, USA. 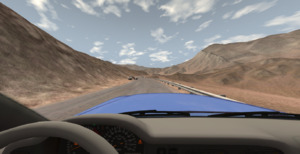 17-year-old Brian Oritz was driving home from school in his newly purchased Ibishu Pessima, being followed by 32-year-old Kevin Jackson, who was driving an Ibishu Blackfoot. As they were travelling down the highway near the town of Firwood, 22-year-old Emily Garcia was turning left onto the highway. Distracted by their mobile phone, Emily made the turn without noticing the cars, causing the Pessima to strike her vehicle in the left side. The Blackfoot tried to avoid the accident, but hit a tree on the side of the road. Luckily, the Blackfoot was equipped with a dashcam that caught the whole event. Video of the incident is linked below. Injuries (if any): Brian had a broken wrist and sprained ankle. Kevin had a concussion and broke 3 ribs, and Emily had a broken arm. September 14, 2011. Police were searching for the ETK but somehow, had no luck. Later that evening, 38 year old Officer Gerald Dennis was driving down a 2 lane Highway when he saw a vehicle turn without a blinker and without yielding. He pulled over the driver, 29 year old Billy Gilmour, and started talking with the driver. 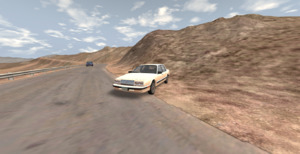 A few minutes into the stop, Gerald got back in his car to run Billy's plates when suddenly, an ETK K came flying around the small curve, nearly hitting Gerald's cruiser and smashing into the back of Billy's car. Gerald called for backup, which arrived about 12 minutes later. Injuries: Billy had a moderate concussion to his head, and a few fractured bones. 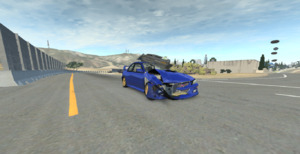 The driver of the ETK also had a concussion. He also had a cracked rib, and several other broken bones. 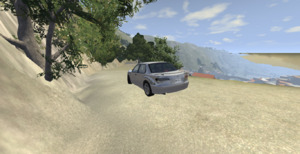 Cars used: A Gavril Grand Marshal, a Hirochi SBR and a ETK K.
Aftermath: Police arrested the ETK driver, 43 year old Arthur Sampson. He was sentenced to 3 - 6 year in jail for Vehicular Assault, Hit and Run, and several counts of Reckless driving. Both Arthur and Billy recovered from the wreck. Bernard and Billy later sued him for damages. 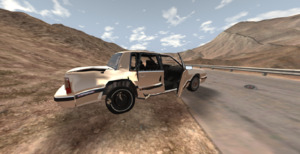 Bernard repaired his SUV, but Billy's SBR was totaled. Now, he drives a custom Sunburst. Gerald is still part of the force and does not plan to retire. Description: May 14, 2017. Daniel Thomas, 45, was driving down the highway in heavy traffic. Behind him, was 17 year old Angelica Parkins, following her was the Dean family, Susan Dean, 40, Mark Dean, 48, and twins Andrew and Zachary Dean, both 16. When traffic stopped, Daniel Stopped, unfortunately, Angelica was distracted on her phone, causing her to slam Daniel hard in the rear. And despite Mark's hard effort to swerve, he clipped the back of Angelica's car. Injuries: No one in the Dean family's car was injured. Angelica had sever injuries, and Daniel had a few cuts and bruises. Lawsuit/Aftermath: Angelica was sued by Daniel's company for totaling the van, and unfortunately Zachary was killed in a motorcycling accident a few months later, leaving Andrews mental condition to decline..
March 8, 2018. Several drivers witnessed a bad accident and called 911. Police showed up to the seen within 8 minutes. They manged to clear one lane of traffic as they waited for the tow truck. As 52 year old Miles Harris waited to merge, 26 year old Jolene Enriquez and 17 year old Lindsay Enriquez both came up behind him, also waiting to merge. Then 33 year old Tony Pollard came up behind, also waiting to merge. About 3 miles behind them, Kyron Sharma was speeding down the highway, testing his new car. He wasn't paying attention to the road, instead, he was paying attention to his speed. He smashed into the back of Tony, launching his truck 10 feet into the air, then coming to rest on Kyron's engine. Tony's truck also smashed into the back of Jolene's car, which hit the back of Miles' car. Police called for more back up. Injuries: Kyron had severe head, spinal, stomach, etc. injuries. Tony had severe whiplash and several broken bones. Jolene and Lindsay had some minor whiplash, but no broken bones. Miles was shaken but was ok.
Cars used: A Hirochi Sunburst, a Gavril D15, a ETK 800, and a Bruckell Moonhawk. Aftermath: Kyron later died of his injuries in the Hospital, everyone else healed up. The accident was cleared within 6 hours. Miles thankfully had a rear facing dashcam. He showed it to police the next day. 4 people are carrying this thread. 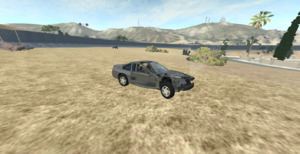 Crash Description: Arthur was driving his brand-new K-Series on the freeway. Meanwhile, Caleb had just spun out in his Roamer due to a fishtail. Arthur took his eyes off the road to send his friend a text. After sending the text and bringing his attention back to the road, he realized he had made a big mistake. Estimated Repair Cost and/or Totaled: The K-Series was repaired, but at a high cost of $15,000. The Roamer was repaired for $4,500. Aftermath (lawsuit etc): Arthur apologized. He thought the ETK was a handful, so he bought a nice D-Series and sold the ETK. 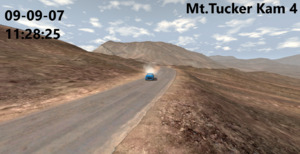 Caleb also decided to apologize because even if Arthur was texting and driving, he felt as if the accident wouldn't have happened if he didn't brake while cornering at highway speeds with off-road tires. June 10, 2007. Jerry Amos was making his way home after fueling up his car. In the opposite direction, Greg Hoffman was delivering plastic cups to the same gas station Jerry just fueled up at. As Jerry and Greg were about to meet, a rabbit jumped in-front of Jerry. Jerry hit the rabbit and slid into the rear axle of Greg's trailer. The trailer was punctured and a box of cups spilled out. After the impact, Jerry then spun into a tree, which punctured the tank, spilling brand new gasoline into the ground. Injuries: Jerry amazingly only had minor injuries to his head, shoulder, a neck. Greg was slightly shaken. The rabbit was found dead a few yards away from Jerry's car. The big tree later died due to the gasoline and was cut down a year later. 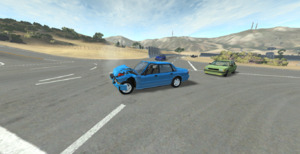 Cars used: A Gavril T and a ETK I. Aftermath: Greg helped with Jerry hospital bills. The 2 are now great friends and often remind each other of near death experience. Greg is still a Trucker and Jerry drives a new ETK 800 Sedan.